Here’s a look at what is going on in San Diego sports for the week of April 15th-21st. 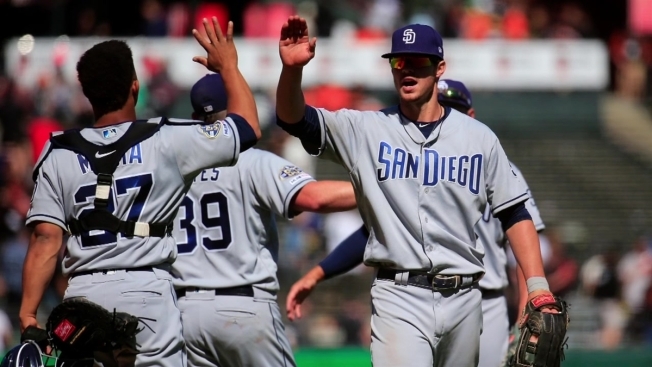 PADRES: The Padres are back at Petco Park this week. Monday and Tuesday they host the Colorado Rockies. Monday is Jackie Robinson Day with a 7:10 p.m. start time and Tuesday’s game starts at 6:10 p.m. and its Taco Tuesday. The Friars are off Wednesday before a four-game set against the Cincinnati Reds. Thursday and Friday are 7:10 p.m. start times with Cocktail Fest Friday. Saturday’s game starts at 5:40 p.m. and all fans get a Swingin’ Friar Poncho Fleece Blanket. Sunday is Military Appreciation: Welcome Home U.S.S. Essex with a 1:10 p.m. start. SEALS: The Seals host the Colorado Mammoth Friday 7 p.m. at Pechanga Arena. -MEN’S GOLF: Monday-Wednesday at the Western Intercollegiate Western Pasatiempo Golf Course in Santa Cruz. -WOMEN’S GOLF: Monday-Wednesday at the Mountain West Championship in Mission Hills. -BASEBALL: Tuesday at UC Irvine, Thursday and Friday vs. Air Force 6 p.m. at Tony Gwynn Stadium and Saturday vs. Air Force 1 p.m. at Tony Gwynn Stadium. -WOMEN’S TRACK: Wednesday-Friday at the Bryan Clay Heptathlon in Azusa, Friday and Saturday at the Beach Invitational in Long Beach and Saturday at the Mt. SAC Relays in Torrance. -WOMEN’S LACROSSE: Wednesday at Arizona State and Saturday vs. Fresno State 1 p.m. at the Aztec Lacrosse Field. -ROWING: Friday vs. UCSD 7 a.m. in Chula Vista. -MEN’S TENNIS: Saturday vs. UNLV TBA at the Aztec Tennis Center. -WOMEN’S WATER POLO: Saturday vs. UC San Diego (Harper Cup) 1 p.m. at the Aztec Aquaplex. -BASEBALL: Tuesday at California Baptist, Thursday and Friday vs. Portland 6 p.m. and Saturday vs. Portland 1 p.m. at USD. -WOMEN’S TRACK: Thursday and Friday at the Bryan Clay Relays in Azusa and Thursday at the Mt. SAC Invite in Torrance. -MEN’S GOLF: Friday and Saturday at the Cougar Classic in Provo, Utah. -WOMEN’S ROWING: Friday and Saturday at the Clemson Invite. -WOMEN’S TENNIS: Friday at Saint Mary’s and Saturday at Pacific. -MEN’S TENNIS: Saturday vs. Pacific 1 p.m. at USD. -MEN’S GOLF: Monday and Tuesday at the UCSB Intercollegiate. -TRACK & FIELD: Wednesday and Thursday at the California Decathlon/Heptathlon in Azusa, Thursday and Friday at the Bryan Clay Invitational in Azusa, Friday and Saturday at the Beach Invitational in Long Beach and Friday and Saturday at the Mt. SAC Relays in Torrance. -MEN’S VOLLEYBALL: Thursday-Saturday at the Big West Tournament in Honolulu. -BASEBALL: Thursday-Saturday at Cal State L.A.
-MEN’S ROWING: Friday at Saint Joseph’s and Saturday at the Kerr Cup Invitational Regatta in Philadelphia. -WOMEN’S ROWING: Friday vs. San Diego State 7 a.m. in Chula Vista. -SOFTBALL: Friday and Saturday at Cal State San Marcos. -MEN’S ROWING: Saturday at the Kerr Cup Invitational Regatta in Philadelphia. -WOMEN’S TENNIS: Saturday at Pomona-Pitzer in Claremont. -WOMEN’S WATER POLO: Saturday at San Diego State 12 p.m.
-WOMEN’S GOLF: Monday-Wednesday at the CCAA Championship at Rancho Santa Fe. -WOMEN’S AND MEN’S TRACK: Wednesday-Friday at the Bryan Clay Invitational, Thursday-Saturday at the Mt. SAC Relays and Friday and Saturday at the Beach Invitational in Long Beach. -BASEBALL: Thursday-Saturday at Cal State San Bernardino. -SOFTBALL: Friday vs. UC San Diego 1 p.m. and 3 p.m. and Saturday vs. UC San Diego 12 p.m. and 2 p.m.